As an avid birder as well as a student at BSU, I always love it when something I learn at school relates to my birding addiction. Last semester, when taking a class called “sensory ecology” I got the chance to hear a lot of things about birds that I could apply to birdwatching, so I’ve decided to make this subject the topic for my next few blog posts. So, what follows is a bit more sciency than birdy, but I hope you guys will stick with me through this post, and I will try my best to make it make sense! How are Robins such good ventriloquists?? We all know that birds have a variety of vocalizations. Of course there are the songs that most people think of, but then there’s the wide range of calls, each with a different function that is adapted for use in different situations. The particular high pitched call of a robin (and many other birds, such as sparrows, chickadees, Golden-crowned Kinglets, or waxwings) is a communication call meant for reaching other members of the flock. 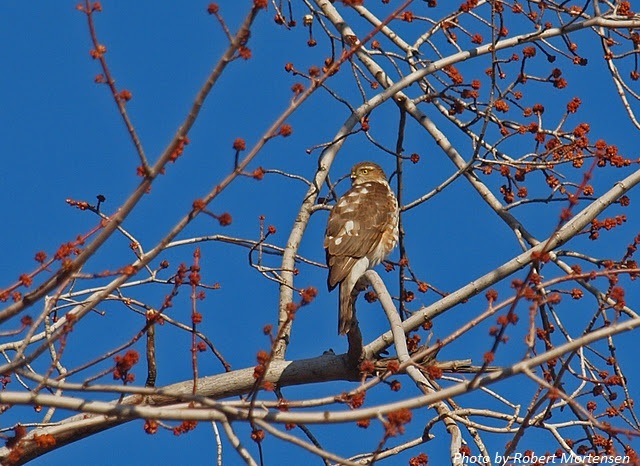 But of course there’s a problem, because any sound a bird makes has the potential to be intercepted by an unintended recipient (like a sharp shinned hawk for example)….so how can robins and other birds communicate to their flock-mates without also alerting a predator to their presence? They take advantage of certain properties of sound to avoid detection. Birds communicate with high-pitched calls for a reason. First of all, their high-pitched calls don’t carry very far in the environment…high frequency sound attenuates more quickly, especially in vegetated habitats (so the call won’t reach that sharpie perched a few hundred feet away). Second, many raptors have the best hearing at low frequencies (to pick up rustling noises) but are not able to hear as well as you reach higher frequencies. And third, it is possible that these calls are more difficult to locate even if they are heard, especially for mammals with big heads….let me explain. 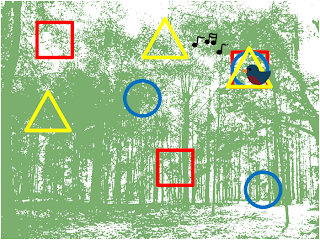 When we hear a sound, humans use a combination of many methods to localize it. Just like using crosshairs to find a target (or a coordinate graph, if we want to flash back to 8th grade math class), we need to find where the sound is in the horizontal plane (was that sound from the left or the right?) as well as the vertical plane (was that sound above or below me?) in order to exactly locate it. 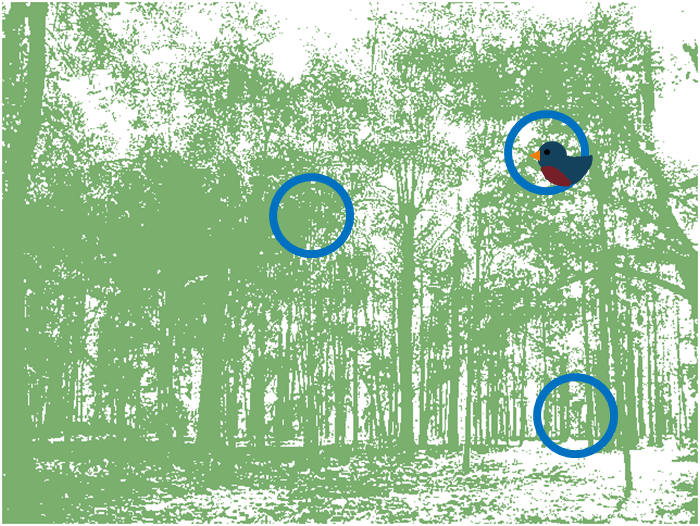 Mammals use different techniques to find each piece of the crosshair. When a bird with a small head hears a high frequency noise, the sound wave hits each ear in a completely different way….the wave may be curving down when it hits the left ear, and “up” when it hits the right ear, so it is easy for the brain to tell which ear received the sound first. 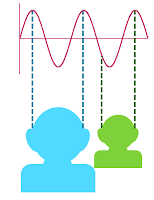 However, when a big-headed human hears the same frequency, the wave may be curving in the exact same way when it reaches both ears, making it seem like the wave hit both ears at the same time, so that it is very difficult to tell where the sound came from. Not only do our big heads prevent us from locating a robin alarm call, but the fact that we are mammals also messes us up! We are different from birds in this way because we have these funny looking external ears. Those strange curves and spirals in our ears are actually there to help us localize sound in the vertical plane. When a certain frequency hits our external ear, it bounces off at a few different places...this tells our brain that the sound could have come from a number of possible locations. When a sound has many frequencies, each frequency reflects a little differently, giving us multiple clues to the sound’s actual location. Using these multiple frequencies, our brain uses “binaural spectral comparison” to calculate where the sound came from in the vertical plane. If this doesn’t really make sense, check out the picture below: When a bird sings, its song often has multiple frequencies (in this example the song has three). 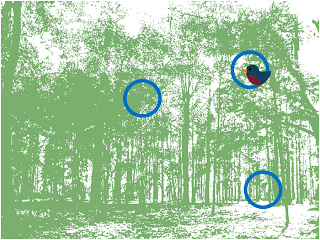 Let’s say one frequency tells us that the bird could be in any of three different locations (the blue circles), then a second frequency tells our brain that the bird could be in three more possible locations (the red squares), and so on…our brain can use all these cues to calculate where the sound is coming from because there is only one location where all three frequencies intersect. But what happens when the sound has only one frequency? Mammals run into a problem, and here’s where robin ventriloquism comes in. Unlike its song, a robin’s high-pitched call is not composed of so many frequencies. 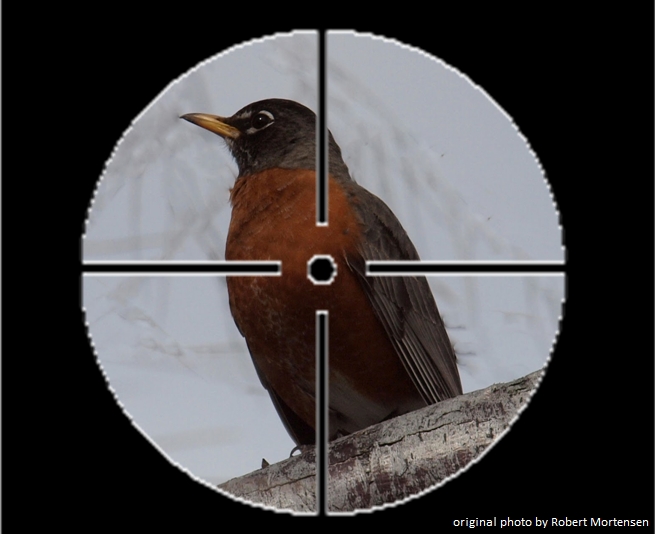 So when birders are looking at the robin and we hear it call, our brain can’t calculate which location is the right one, making it seem like the robin can throw its voice. So, now that we know this, how can it help us as birders? Well, first off it can maybe help us not feel crazy when we swear we heard the Golden-crowned Kinglet from that branch right there….it’s actually just as likely the kinglet has used its anti-predator adaptations to fool us! We can also use some of our own adaptations to help us localize high-pitched bird calls better. See, while high frequency sounds don’t work so well for binaural phase comparisons, our big heads can actually help us out when we are trying to locate a sound, because we have a second method for determining a sound's location in horizontal plane: High frequency sounds have small wavelengths that are too short to travel around our heads. Instead, they hit our head, and create a “sound shadow” on the other side….this means that if a sound comes from the left it will seem loud in our left ear and much quieter in our right ear. By turning your head slightly sideways from where you think the bird is, you can create a sound shadow which will help you tell which side the bird is on. Well, there you go! 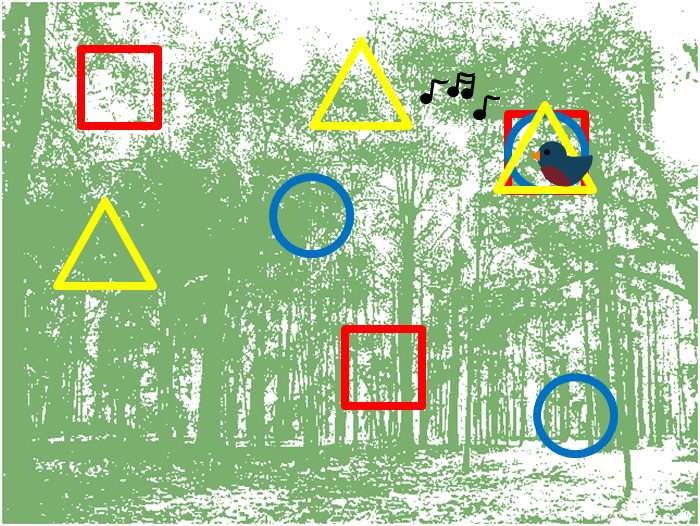 The first of my Sensory Ecology blog posts. I hope you guys enjoyed learning about the science behind some common birding conundrums! Very interesting post - love this kind of thing. cheers and Happy New Year. Happy New Year to the Birding is Fun clan! Robert, sometimes you amaze me! How do you know all this stuff? 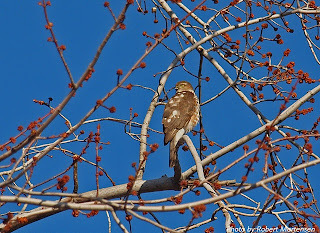 Very interesting post and a lot to think about as I go out birding in 2012! Happy New Year to You! Fascinating. Sure explains some things I've encountered in the field. Very interesting post! Kathie, I wish I could take credit, but this post was from Heidi Ware, a fantastic and enthusiastic birder and grad student at Boise State who also works at the Idaho Bird Observatory. Great post, Heidi! Makes perfect sense of my recent experience of trying to locate a sparrow in dense thickets on both sides of a trail - repeated high frequency low amplitude calls very close by but was never able to figure out where the sparrow was actually at. Won't feel so stupid next time around. Thats fascinating Heidi! I knew that high-frequency sounds were more difficult to locate than lower frequency ones, but your post has turned it into a very interesting subject!